Okay this is super ironic that I’m sharing a fashion post right now. Back in middle school I was called the 34 shirt girl. I wore so many layers and being trendy or fashionable was never even a thought in my mind. Never in a million years did I think I would be writing a fashion post or modeling for you. And yet here I am. Today I’m so excited to show you my first clothes from Trunk Club. 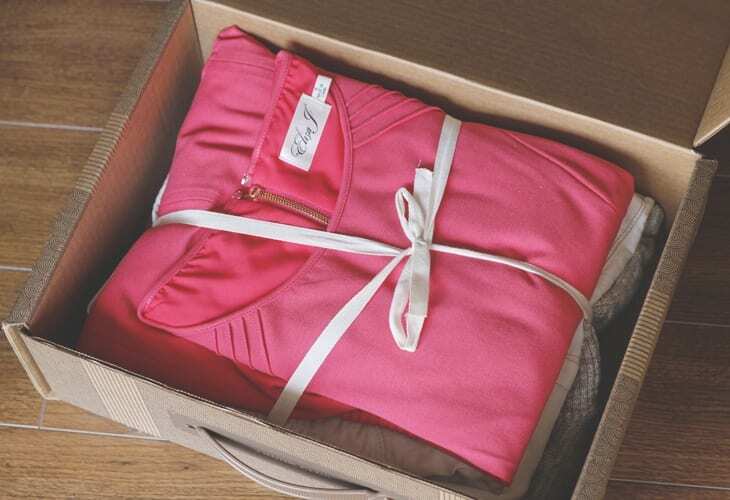 If you’ve heard of Stitch Fix, Trunk Club is just like that but way better! You have no styling fees and no minimum purchase. Here’s how it works. 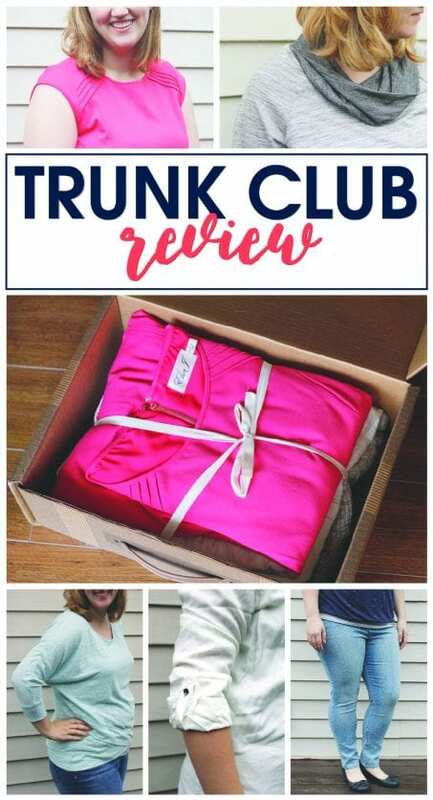 All you have to do to get started is go to TrunkClub.com, choose 3 looks that match your style and then you’ll be prompted to put in your sizes that will be sent to your stylist. After you’ve entered all your info then your stylist will be in touch. After a phone call (or email) to chat with your stylist, then you get an email letting you know you can take a look at your trunk online. A few days after approving your trunk your first trunk will arrive at your doorstep. I’m seriously in love! Granted, I’ve only received one trunk so far, however, my stylist, Gretchen, was super sweet. She listened to what type of clothes I was looking for and put together a few trunks for me. After she chose some pieces I could look through them online and if I knew for sure I didn’t care for a piece of clothing I could mark it to not be sent and then she added some more clothes to the trunk. After that she sent the trunk and a few days later this magic appeared at my door. I’m an adult. I’m a mother. I’m in this awkward stage with clothes from high school still and a mix of business professional clothes from my days as a business major in college. And then you throw in the clothes from my last job where I dressed in business casual. Since freshman year in college, every night I come home and change into sweats. Therefore, I have professional clothes and cozy clothes. Now that my job is being a mom I have nothing to wear. So enter Trunk Club and my saving grace! So here is the breakdown of what I got in my first trunk and a few photos so you can get an idea of what type of clothes you can get. Also, I’d love your thoughts on these clothes. I already had to send back my trunk but if you got these clothes, would you keep them or return them? Super comfy and so soft. I could live in that top every day of my life. 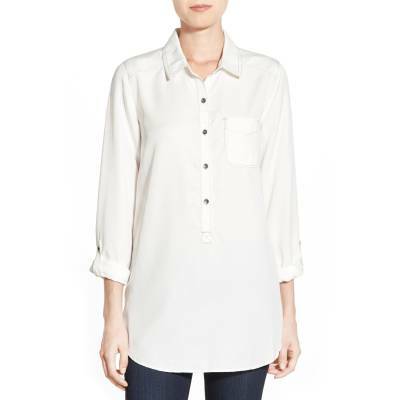 However, I already have a shirt really similar so the hubs said no. Loved these jeans! I’ve never worn skinny jeans. EVER! But the minute I put them on I was sold. It felt like I was wearing leggings but could actually leave the house in them and not be ashamed. I can say honestly I have never spent even half as much as I did on these jeans, however, it’s so worth it. Like I mentioned earlier, I need a whole new wardrobe. The last jeans I bought for $8 from Goodwill. And that was a year ago after I was tired of wearing maternity jeans still. So, I think I’m allowed one clothing splurge in my life. 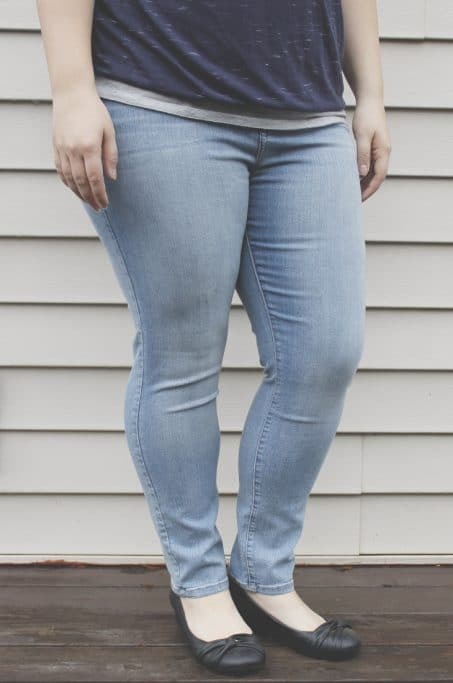 I’m just hoping these jeans last for years! I had told my stylist I was open to trying anything and would love some new jeans. She sent me three jeans. These were the winner! 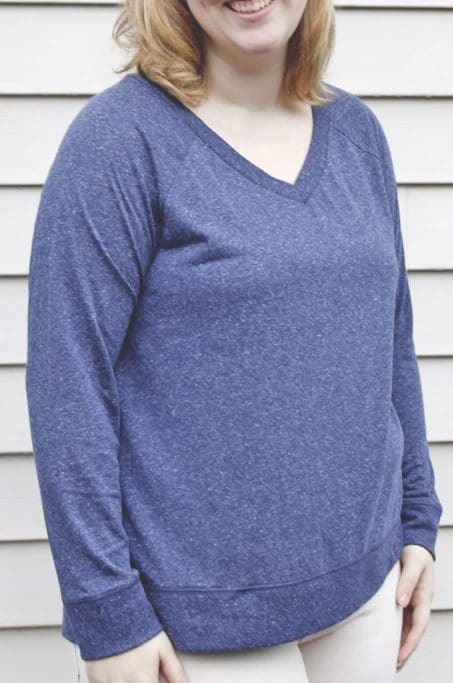 At the time I talked with my stylist I was still nursing (I have since weaned) but had mentioned I’m always looking for shirts that have easy access. 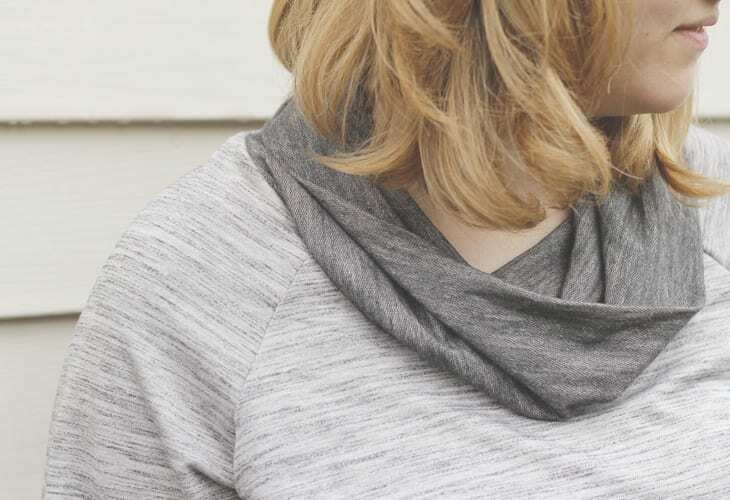 This shirt was super comfy and would be great for a nursing momma. 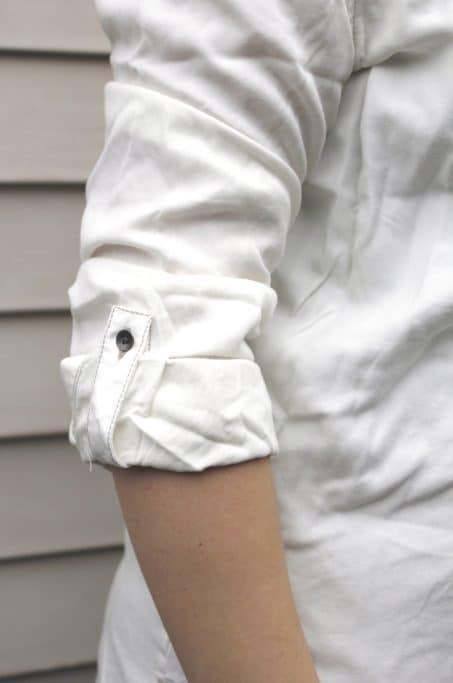 Plus, it has cute cuffed sleeves. However, it didn’t have enough shape and pizzazz. 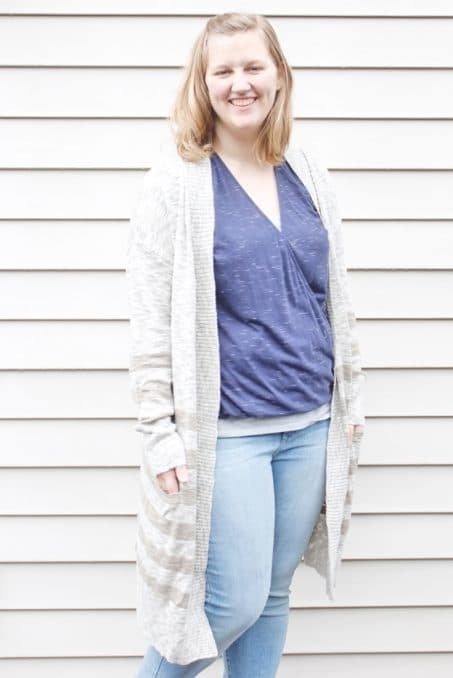 This long cardigan was a little too long for my style and, more importantly, I have one almost identical. Still a good find though! I asked for print…and print I got. This blouse was a little too frumpy for me though, so I passed. 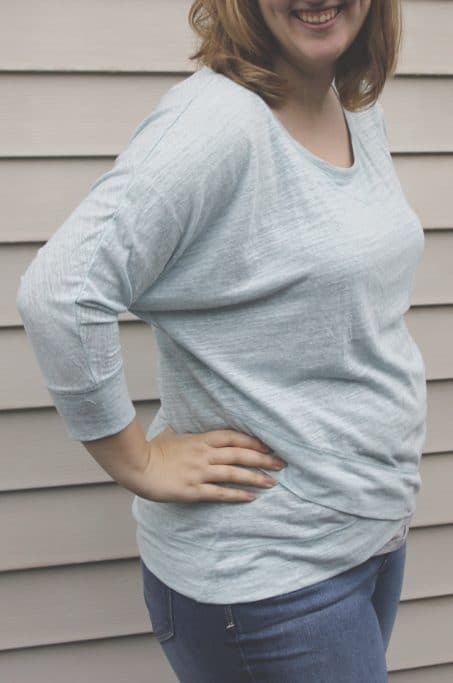 This light blue knit front tee was not for me. The color is a similar tone to my skin and looked terrible on me. I liked how loose it was though and the crossover on the front was fun. This v-neck shirt was super comfy but I felt it matched my current lazy wardrobe I’m trying to steer away from. 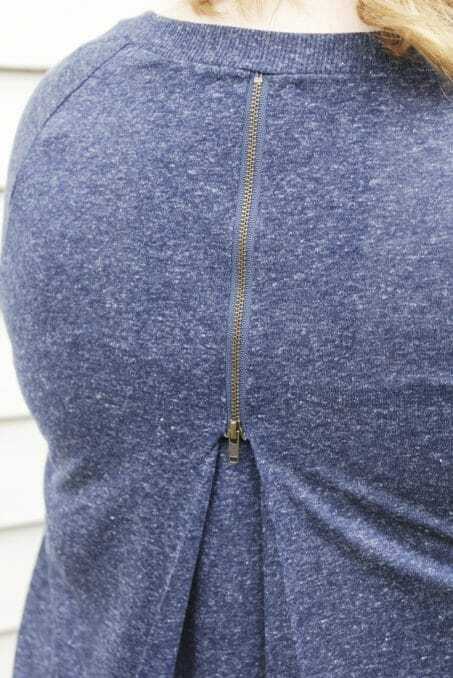 It did have a fun zipper on the back that my husband loved. I forgot to take a full picture of the pants, but I also got these tan ankle jeans. I loved them but so not realistic with a little one who has messy hands pretty much 90% of the day. 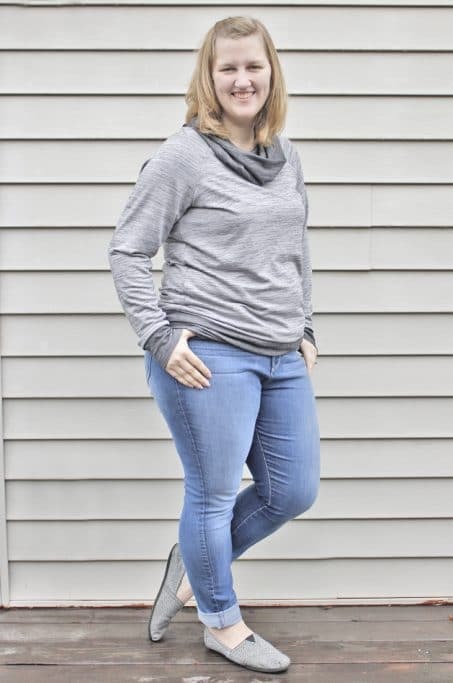 Again with the jeans…love them! I’ve never worn skinny jeans until this day, however, I really didn’t need two new jeans…especially for that price! Super comfy though! I went with the darker pair. I’m going to save you the horror of this shirt, but let’s just say it was not pretty. Big and loose and so not cute. I liked the sleeves though! 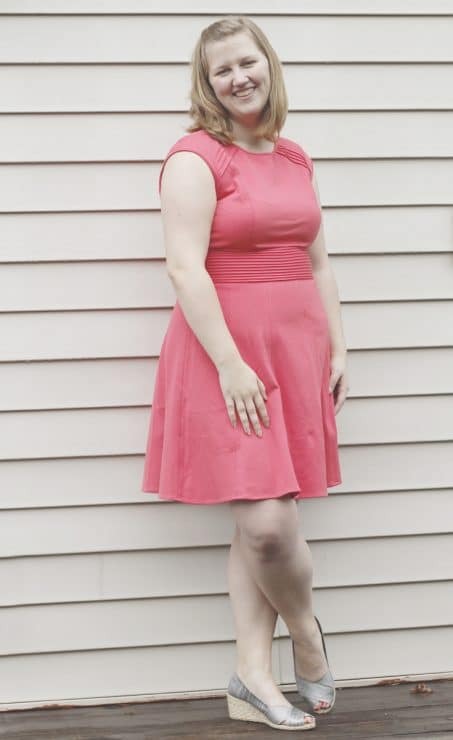 I have a conference coming up in April and requested my stylist send a cute dress. She nailed it! 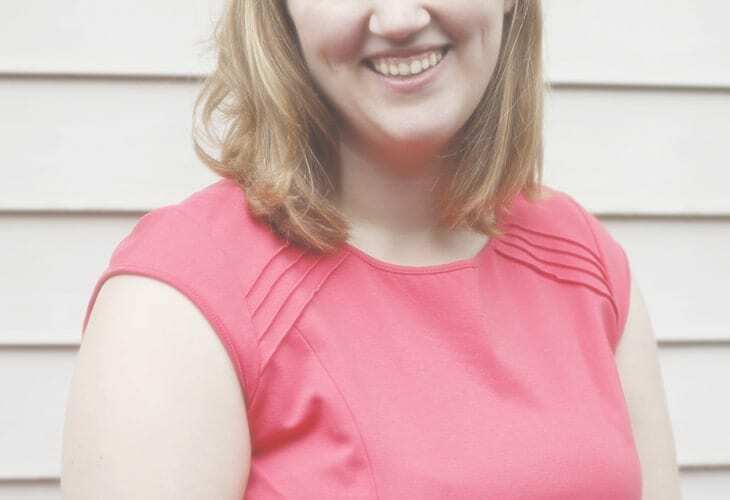 I seriously fell in love with this dress before it even arrived at my door. Definitely a keeper! Super comfy. Slides right over my post-baby bulge that doesn’t seem to want to leave and I love the pintucked empire waist. Plus, the color is gorgeous! So that was all the clothes I got in my first Trunk Club order. They make it so simple for you! You have 10 days to try on all the clothes and then send back what you don’t want to keep. Once you’ve decided, you can use either the mobile app or the desktop site to go through each item and mark keep or return. 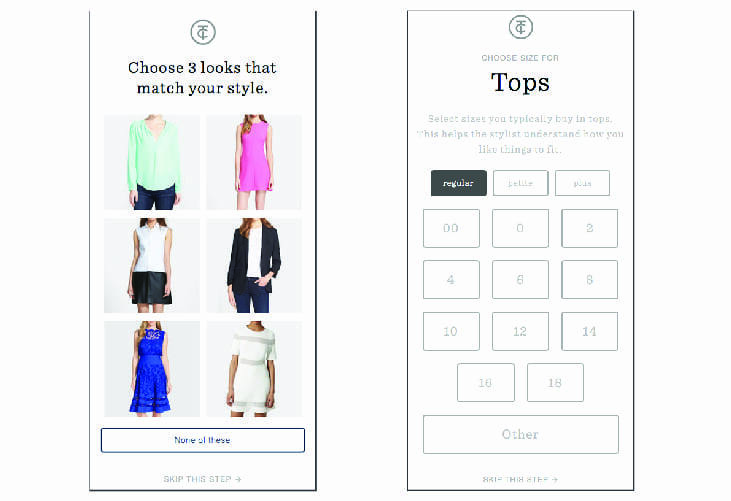 In each clothing item section you can give feedback to your stylist on what you liked or didn’t like about each piece. So now it’s your turn! You literally have nothing to lose. 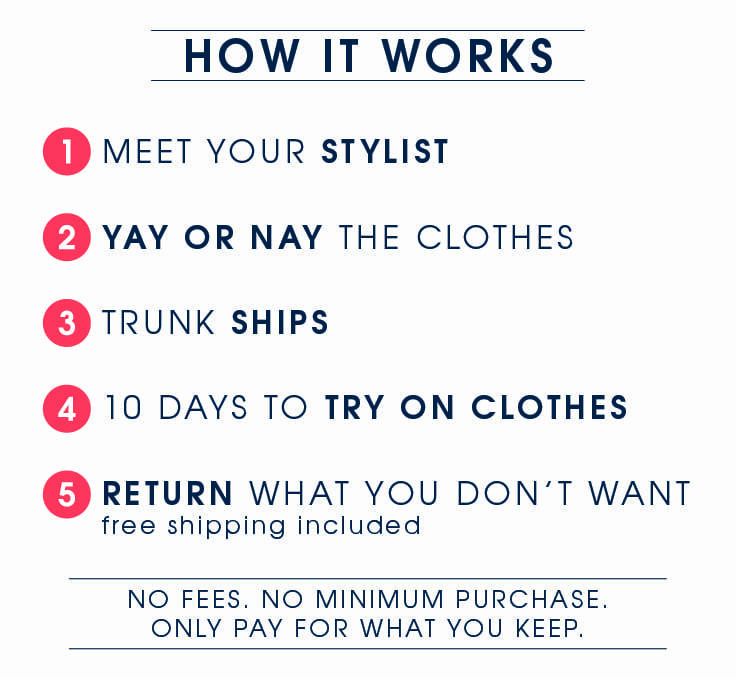 Remember, there are no styling fees, no minimum purchase, and no charge for shipping either way. I can’t wait for my next trunk to arrive! Go let your stylist know what your style is here. I agree with Erin! 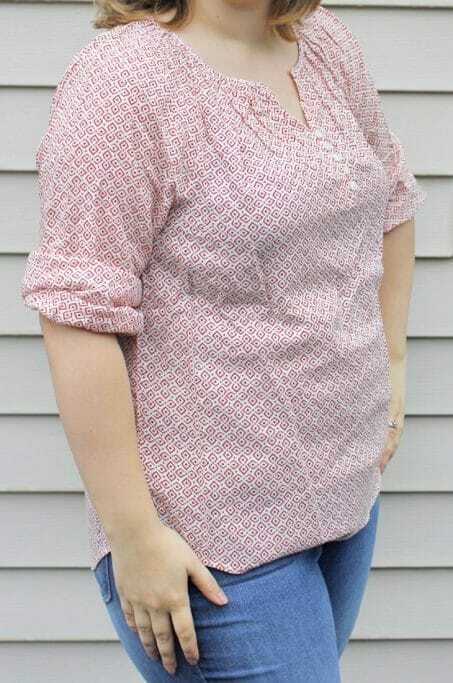 Peasant shirt SUPER cute! Also, the light blue cross over tee… HEART EYES! !